38 posts categorized "Posts by Tom"
Sarah and Eric H., a godly young man from the Atlanta, GA area, are now engaged to be married! 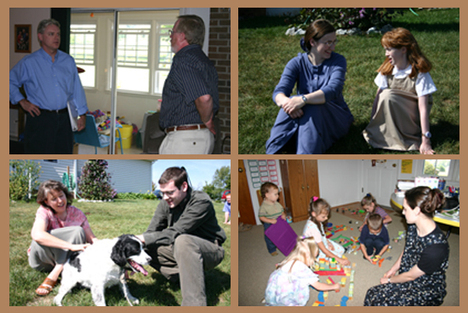 In God’s providence, our families got to know each other over the last few years with some conference visits, home visits, and some email correspondence. In May, Eric and Sarah started seeking the Lord’s wisdom in a courtship to determine whether it would please Him for them to marry. After gaining the prayerful blessing of both sets of parents, Eric proposed to Sarah this past Labor Day weekend – and she said Yes! We do praise our gracious God for the work He has done in the hearts and lives of Eric and Sarah and our families. He is very good! Please pray for them as they continue to seek to honor the Lord in their wedding and their married life together. Last week my Dad called from Connecticut to let me know that my Uncle Al (Dad's brother) had died. Uncle Al has been struggling against cancer for some time now. Dad had gone over to his house to stay with him for a while so his wife Pat could go out to do some errands. But a few minutes after Dad's arrival, he suddenly passed away. His funeral service was on Thursday, and he was given military honors (WW2 vet). We will miss him. 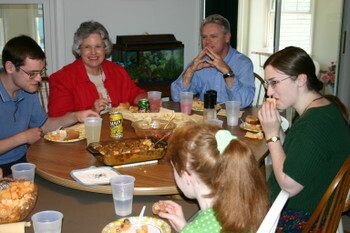 He and Aunt Pat (like many of my extended family) were very accepting of my bride, Deb. He would ask her lots of questions to find out about her background, and he would also give her some good-natured ribbing (she's from the south, he's from the north). We enjoyed chats with him when we visited in New England. He was very jolly and full of laughter. He liked to tell stories. He could also turn on a dime and talk very seriously about issues of life. And he had some decided opinions on things -- no doubt about where he was coming from. I can't remember the context or subject, but he was relating a conversation/debate he'd had with someone. I recall that Uncle Al told the person something to this affect, "Look, the main thing I care about is going to heaven. The rest of the stuff is not as important." He loved hamburgers. He was the original Wimpy (refer to old Popeye cartoons for those of you who don't know who that is). Please pray for Aunt Pat as she deals with the loss of Uncle Al. She has been having her own struggle against cancer for a few years now. She has a pretty spunky and enjoyable personality, as you can probably tell from the picture above. But she really needs the strength of the Lord right now. Please pray that she would know Him. A few weeks ago, our church fellowship had a special celebration. We brought to mind and gave thanks to the Lord for how He sovereignly worked to bring us together one year prior. Each head of household related the details of his family's experience of how we met and were drawn together. We then had a time of thankful prayer, and after some time in the Scriptures, we enjoyed our Lord's Table meal -- complete with a Sarah-baked anniversary cake. It was a very encouraging time in the Lord, and we appreciate these dear folks with whom we have been knitted together. Inspired by our brother Erich, and motivated by our desire for some fellowship-fun with the rest of the church, we recently went on a hike together. The Shenandoah Valley has some great resources, including lots of trails through mountains and hollows to enjoy. So we planned a Saturday when we would hike together in the afternoon then come back to our home for a picnic supper and games. After some research, we settled on the Trimble Mountain Trail in northwestern Augusta County, near the Todd Lake Recreation Area. TMT is a 4-mile loop with moderate and easy parts. We got trail maps and directions off the internet, ready to go. The Hochstetler family met us at our house, and we caravaned up there, intending to meet Erich, who was driving down on his new motorcycle, at the trail head. But the best laid plans.... We had to drive up and down the area a few times and stop to ask three people before we finally found the well-camoflaged trail head. One problem still: Erich had still not arrived. We searched the road in each direction but didn't find him. No cell service to call him. So we prayed for him and launched out on the trail. Deb "stayed by the stuff" and did some knitting in the van to guard the base camp and watch for Erich. The first part of the trail was a LONG uphill climb, first through a field, then mostly through woods. We definitely got our exercise. We enjoyed the outdoors along the way, pointing out things like millipedes, bright metallic green bugs, a pretty blue butterfly, and other items to Madeline. Madeline also kept us entertained with her commentary (it was very refreshing to see a young lady so comfortable talking to adults). She also demonstrated how a Queen Anne's Lace flower smells like carrots when you break it. As the loop (finally) topped and levelled out, we saw some pretty views of Reddish Knob and Shenandoah Mountain. We took a rest up there, and then we heard it -- the crackling of our walkie talkie -- it was Erich! After a few minutes, up he walks to join us. It turns out he had gotten a little turned around among the county roads, and arrived at the van about half an hour after we started up the trail. So, like the trooper he is, he double-timed it non-stop up the hill until he caught up with us. Must be nice to be young! We were relieved to see he was OK and glad to have him with us. The latter part of the loop was level, then downhill, so it was much easier and faster. We got back to base and the Gatorade after about two and a half hours. We were tuckered, but happy with how it went. After that, we caravaned back to our house, fired up the grill, and had a great supper prepped by the ladies (THANK YOU!). We got to have the first church-initiation of our new picnic table in the yard. Just as we finished eating, a thunderstorm rolled through, so we hustled our stuff inside (we later found out that a tornado hit a rural area about an hour northeast of us). A friendly game of Pictionary ensued, guy team vs. girl team, and the guys actually won (that doesn't happen very often). After that, it was time for good-byes and going home for some shut-eye. Deb gave me this book about a year ago (last Christmas), and I am just now starting to read it. I really look forward to it! From the Introduction by Tryon Edwards, 1851: "The subject of these Lectures is eminently practical and important. Love is the first outgoing of the renewed soul to God - "We love him, because he first loved us." It is the sure evidence of a saving work of grace in the soul - "The fruit of the Spirit is love." 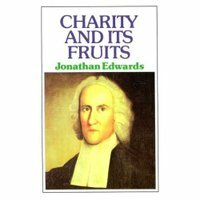 "
From Lecture 1: "The word [charity] properly signifies love, or that disposition or affection whereby one is dear to another... [re 1Corinthians 13] And by the apostle's mentioning so many and so high things, and then saying of them all, that they profited nothing without charity, we may justly conclude, that there is nothing at all that avails anything without it. Let a man have what he will, and do what he will, it signifies nothing without charity... Love will dispose the Christian to behave toward God, as a child to a father; amid difficulties, to resort to him for help, and put all his trust in him... It will dispose us to praise God for the mercies we receive from him... Love, again, will dispose our hearts to submission to the will of God, for we are more willing that the will of those we love should be done, than of others." Where? That's the place where I spent most of my growing-up years. Technically a small village incorporated into the town of Montville in southeastern Connecticut, most of my memories of childhood and teen years revolve around this small New England burg. After my birth in nearby New London, at an age too young for me to remember, my parents moved us to Uncasville, into a small house on Maple Avenue. It had light green painted cedar shakes for siding, an upstairs, downstairs, and a basement, along with a hill on one side that was great for sledding. The fields and woods behind the house seemed to stretch for miles when we would go exploring as kids, though when I looked there in later years, they had shrunk to a much smaller size. I attended Palmer Memorial Elementary School, St. John's Jr. High School, and St. Bernard's High School there. There were four of us siblings in the family. Our parents taught us about God, respect for Him, and being decent people. And they had great love for us. These foundations were later used by the Lord to draw me to Him. 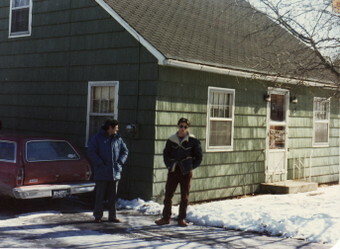 In the picture on the right, that's my dad and me standing in front of 195 Maple Avenue on a cold February day in 1980--the weekend I proposed to Deb in the living room of that house. In the mid-90s, Uncasville had the dubious distinction of becoming home to the Mohegan Sun, owned and operated by the Mohegan Tribal Nations, one of the largest gambling casinos in the world. From what my sister tells me, the effects on the area are not altogether positive. My dad is now retired (he worked many years for General Dynamics Electric Boat division, a major economic influence in the region). He lives in nearby Quaker Hill, not far from where he grew up himself. Soon we'll be taking a trip up to Uncasville to spend a few days with my dad and siblings and family. We haven't made that trip for a few years, so it will be enjoyable to be around them again. We first met the Wagner family last year, followed by a providential encounter in Martin's grocery store. After some emails and phone calls, we started getting to know one another with visits to one another's homes. 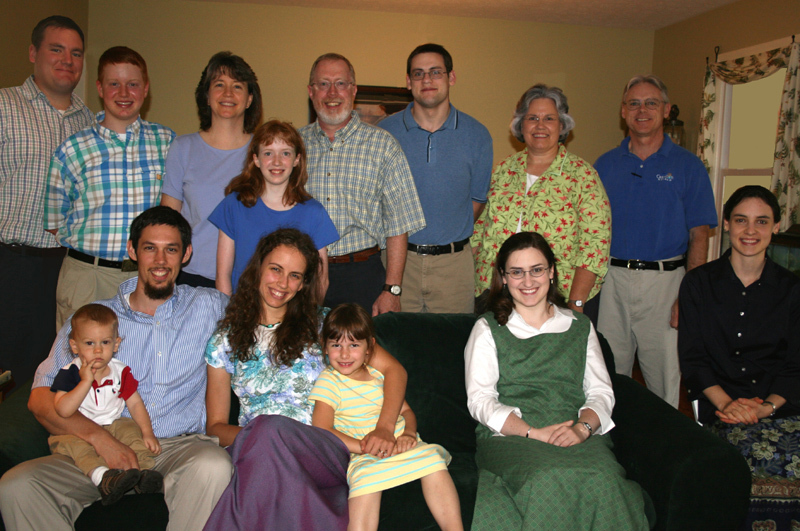 They are a dear and gracious family who love the Lord, and they are a joy to be around. The Lord has knitted our hearts as we have spent time together discussing views on family, church, theology, leadership, schooling, etc., as well as learning each other's backgrounds and having some good old fun. After some months, we decided to take the plunge and started meeting together as a fledgling church. We swap hosting, hospitality, and teaching back and forth. We've enjoyed fellowshipping with several visitors including the Murphy family and their five children who were in the area from Washington State, a local farm intern who stopped by as he searches for a church to attend, and Deb's mom who has visited a few times. 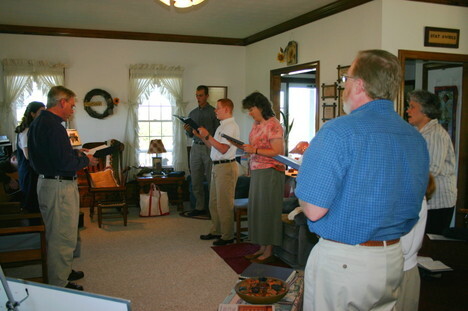 Our Lord's Days together typically start with greetings, smiles, and chat, followed by prayer and singing some hymns (some chosen ahead, some chosen spontaneously). Then we'll usually share about what is going on in life, praises and testimonies on how the Lord is working, concerns and prayer requests, then prayer together. Then, more hymns (we'd like to start learning some psalms in parts soon), followed by the main teaching with some expansion and/or questions by the other men. We pray and move to the eating area to celebrate the Lord's Supper with the elements and a meal (thanks, ladies!). A couple of hours of relaxed fellowship follow, and eventually we disperse home -- encouraged and thankful for the blessing of those whom God has brought into our life. Cindi asks: "What is each of your favorite fictitious book?" 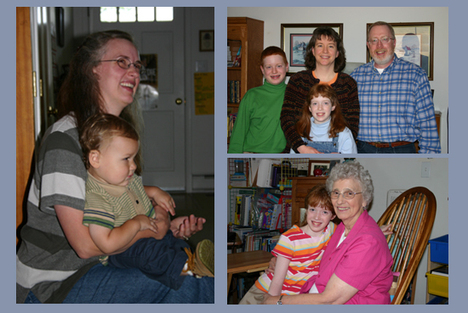 Tammy asks: "Does everyone in the family have a life verse, and if yes what are they?" Chyrll asks: "What is your favorite recipe and recipe book?" Dorothy asks: "I would like to know what your Dad was like, Deb? It is fun to read about your Mom, and she seems to be so sweet...your Dad must have been someone very special, too." Yes, very! 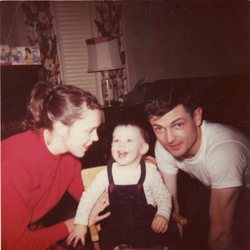 My dad was a quiet, steady, and faithful man. Working in a cloth factory on second shift, he wor ked hard, came home and slept, and went back to work--day after day, year after year. He taught a young boys' Sunday School class for years, and I can still remember the big green set of Matthew Henry commentaries we had that he often studied for his lessons. Growing up, we took family vacations to the Smoky Mountains and traveled to revival meetings and gospel singings, and we always had a fun time as a family. 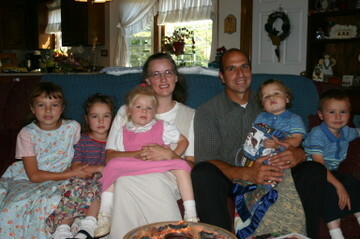 In later years he loved spending time with his grandchildren. 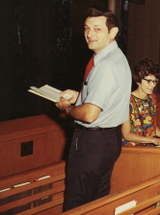 Here's a picture of my dad taken before the Lord called him home to heaven in January, 1999; we miss him very much! And Sherrin had several she wanted to ask including: "When did you begin gardening, and what started you out?" "Do you follow any particular ideas about courtship?" "Do you have a daily schedule?" No, I really don't (although I'd recommend it for a new wife starting out). I usually do things when they need doing rather than planning which day I do them or what time of the day I grocery shop or clean. If we're out of food, it's time to shop. If company's coming, it's time to clean. (That's a little joke there...but, seriously, having company over is a great motivation for cleaning!) I used to be much more schedule-oriented when we homeschooled because I had to make sure a large chunk of time was designated specifically for schooling with additional time scheduled for all the rest of the housework. By training, I am an electrical engineer. My present earthly occupation by which I earn a living for my family is operations & construction manager for an electric utility. Like most work, it is filled with challenges, enjoyments, and frustrations--but never boredom! My role is to lead and organize a group of electric line workers, along with their supervisors and administrative help, to build and maintain a power system in the Shenandoah Valley. We also must restore service when power goes out (due to weather, people, or objects hitting or cutting lines, etc.). Never a dull moment. The important thing to remember is to both: (1) work heartily as for the Lord, glorifying Him by the way I do my work and carry my attitude, and (2) realize that this work is temporal, not getting wrapped up in it for its own sake, and looking forward to being with the Lord for eternity. Maintain that balanced perspective.